After years of rumours and plenty of leaks (some of which have proved to be rather prescient on its design), Nintendo's new home console is here. The artist formerly known as NX has been revealed - meet the Nintendo Switch! As rumoured back in the summer, Nintendo's next gaming platform will be a console/handheld mashup, featuring an innovative gamepad design known as the Joy-Con. These segments can be detached from an official Joy-Con grip accessory (which looks a lot like an Xbox One pad) and slipped onto the side of a slim, gamepad screen. This screen is can also be slotted into the main console of Switch, known as the Switch Dock. All you have to do is slide the controller segments on either side and you're now able to start gaming handheld-style. Say you're playing The Legend of Zelda: Breath of the Wild and you want to pop out of the house or make your way to work. All you need to do is slip on the Joy-Con segments onto either side, lift the pads and screen out of the Switch Dock and boom - your game will disappear from your TV and appear on your Joy-Con. From the trailer, the transition looks instant and shifts your gameplay over exactly as it appeared on your TV, meaning no loss of progress and no need to manually save. And, since this console is both the main unit and a handheld, you don't need to switch the game cartridge to make the transition. 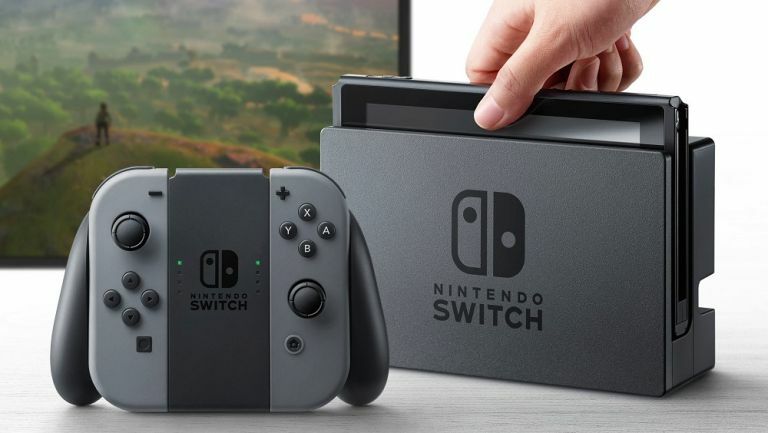 It also means you can play anytime, anywhere, without the need for an internet connection (although, Nintendo has yet to confirm if such a thing might be needed in some capacity). Yes, this is Nintendo after all. Cartridges have proved the way forward with its handheld portfolio since the end of the 1980s so it's not a huge shock to see them appear on the Switch. The big question is just how much capacity will these cartridges have - we very much doubt Nintendo is going to offer a handheld experience with any graphical disparity between the TV-based version, so we're interested to see what innovations have been made to future proof cartridges for a new generation. Here's an unexpected twist, and one that plays on Nintendo's experience with the Wii. As we know, those Joy-Con segments are detachable, but it turns out you can use them independently of the screen itself - just like a Wii U remote. This is brilliant hardware feature, and one that will enable you to play a handheld game without getting cramp in your arms from holding up the weight screen. It'll also give you more playing options at home. We don't know yet if these Joy-Con segments will have motion features, but considering the pedigree Nintendo has with the Wii and the Wii U we'd be very surprised if it didn't feature some sort of additional motion control. The video doesn't make that clear. We do have one reservation - is that portable screen a touchscreen? No one in that trailer used it as such, and Nintendo hasn't mentioned such a feature in the official announcement. Such an omission is telling, considering how prevalent touchscreen tech is, and seems an odd feature to leave out. It's an absence that a lot of potential users will be asking about, so let's hope Nintendo clears this one up real soon. It could be a cost saving measure. Again, this is classic Nintendo thinking at work. Much like how the Wii Remote and Nunchuk combo could enable two players to play at once, the two segments of the Joy-Con will offers exactly the same feature. That means every Joy-Con is actually two mini Joy-Cons in one. If you're out and about and want to jump into a game with a friend, you can now share the experience with a single unit. Following in the footsteps of the Wii and Wii U Pro Controllers, Nintendo has also announced a Pro version for Switch. The Pro Controller will emulate the shape and style of the Joy-Con when attached to a grip accessory, just without said feature included. Considering the dynamic nature of the Joy-Con is does seem like a bit of a redundant idea (although, it could be more comfortable to hold., but Nintendo isn't one to break tradition and another controller option simply gives users another choice when playing at home. Alongside first-party titles that include The Legend of Zelda: Breath of the Wild and an unannounced 3D Mario game (much excite!!!! ), we also saw what looks like The Elder Scrolls V: Skyrim (almost certainly in its Remastered Edition) and a version of NBA Live or NBA 2K. Skyrim alone is a huge game that's going to require a serious amount of processing power - at least on part with PS4 and Xbox One. That means Nintendo Switch is going to have some serious grunt under its hood, especially if it can successfully transition all these games into an instant handheld session. 48 developers have been officially confirmed by Nintendo to be working on titles for the Switch, and while the company is yet to confirm those that will be launching with the console, the presence of Bethesda, Take Two and From Software is proof that Nintendo is coming out swinging. Could we be getting a handheld Dark Souls? Please, tell us we are! Nintendo says Nintendo Switch will also connect up for local multiplayer sessions, presumably much in the same way 3DS' do now. Nintendo has always been a big supporter of connected experiences on a local level so we're intrigued to see how well this feature works. If that trailer is anything to go by, Nintendo is hoping to bring that local multiplayer aspect to a noticeably older audience. Without a child or family in sight, and a bunch of 20-something millennials placed front and centre, we could finally be seeing Nintendo targeting the teen and adult demographics that Sony and Microsoft have courted for so long. 9. It's be done before.. can Nintendo do it better? Here's the thing, the concept of a set of detachable controller sections has been tried before multiple times for the tablet market. Razer Edge is one such example, and it works too - but it was heavy, clunky and very expensive for an accessory. While we don't know how much the Switch will retail for - Nintendo has been very competitive in its pricing with the last few generations. The big difference here is the software library - Pokemon Go has proved just how strong Nintendo licences are, even on other platforms. Add that to brand new, innovative hardware and Switch could be something truly special. 10. It's coming March 2017! March! In 2017! That's five months away! Nintendo aren't known for falling through on hardware release dates so there's a very good chance we could actually be owning new Nintendo consoles within half a year. And with the console generation already halfway through (and with upgraded version of PS4 and Xbox One already on the horizon/out in the wild), there's a very good chance Switch won't be an underpowered offering in the way the Wii and Wii U were.